On February 22, 1512, Italian explorer, financier, navigator and cartographer Amerigo Vespucci passed away. He first demonstrated that Brazil and the West Indies did not represent Asia’s eastern outskirts as initially conjectured from Columbus’ voyages, but instead constituted an entirely separate landmass hitherto unknown to Afro-Eurasians. Colloquially referred to as the New World, this second super continent came to be termed “America“, deriving its name from Americus, the Latin version of Vespucci’s first name. It is believed that Amerigo Vespucci was present when Christopher Columbus returned from his first expedition. He was born and raised in Florence and later embraced a mercantile life. 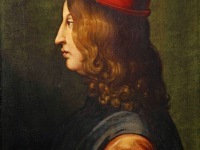 Vespucci was hired as a clerk by the Florentine commercial House of Medici, headed by Lorenzo de’ Medici. Vespucci took over the business of Giannotto Berardi, an Italian merchant who had died in Seville around 1496. He fulfilled Berardi’s contract with the Castilian crown to provide twelve vessels for the Indies. Afterwards, he became a provision contractor for Indies expeditions, and is known to have secured beef supplies for at least one of Columbus’ voyages. 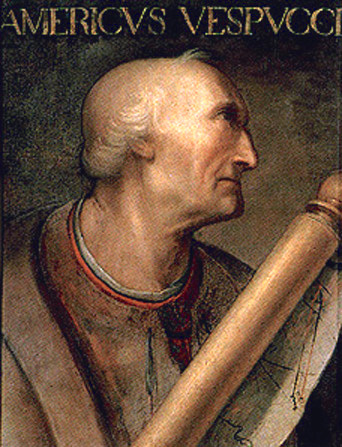 Portrait of Amerigo Vespucci (1454-1512). Possibly painted by Cristofano dell’Altissimo on the basis of an unknown original, although its existence not attested until 1568. No.702 of the collection of Paolo Giovio at the Uffizi in Florence. Vespucci was invited by king Manuel I of Portugal to join a voyage exploring South America. He was probably aboard the ship dicovering that South America’s dimensions were much different than previously expected and reached much further south. Between 1501 and 1502, Vespucci probably traveled in the service of Portugal, departing from Lisbon. The journey was led by Gonçalo Coelho. 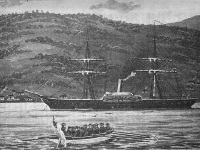 The fleet sailed to Cap Verde and they met Pedro Álvares Cabral‘s ships, which just returned from India. They first reached the coast off Rio de Janeiro and probably also reached the latitude of Patagonia. During the expedition, Vespucci managed to map Alpha and Beta Centauri, as well as the constellation Crux, the Southern Cross and the Coalsack Nebula. Not long after his return to Spain, Vespucci became a Spanish citizen.Vespucci was made chief navigator of Spain by King Ferdinand II in 1508 in honor of his discoveries and he was commissioned to found a school of navigation in the Spanish House of Trade, based in Seville. 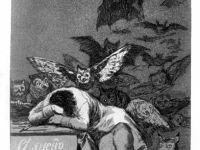 He managed to develop a method for determining longitude that was fairly accurate. Amerigo Vespucci died on February 22, 1512 at his home in Seville, Spain. It is believed that Vespucci‘s historical importance rests more in his letters than in his actual discoveries. Even though the letters’ authorship is disputed until this day, the European public learned about the newly discovered continents of the Americas for the first time from them. Pedro Álvares Cabral and the Discovery of Brazil, SciHi Blog, March 9, 2014.